The City Center Mall after the flood. 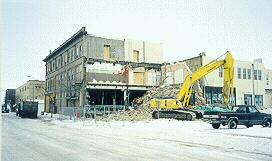 The City Center Mall was built in the 1970's by enclosing the block of South Third Street between Demers and Kittson. It was built in an effort to compete with suburban shopping areas. 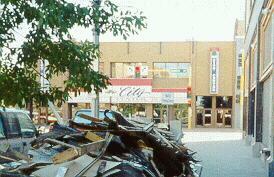 The City Center Mall had limited sucess at best, and was struggling before the flood dealt it the final blow. Not many Grand Forks residents miss the City Center Mall. The roof of the City Center Mall was removed in August, 1998. In November, 1998, after twenty years, South Third Street reopened for traffic. Most of the buildings on the west side of this block remain standing. The city is putting new storefronts on these, and the buildings are available for lease. Some of the apartments above the storefronts have been occupied since the flood. Three buildings remain standing on the east side of the street. These will be renovated and will also be available for lease. A floodwall will be built behind the buildings on the east side. The north half of the block will become a "town square". 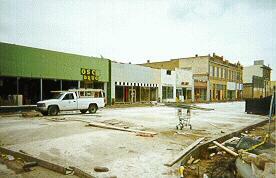 Repaving South Third Street after the roof of the City Center Mall was removed, Nov., 1998. The one-story buildings here were torn down, and the "town square" will be built in their place. East side of South Third Street, Dec., 1998. These three two-story buildings will remain. 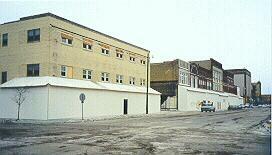 The addition to this building was torn down in Dec., 1998, but the front part will remain standing. 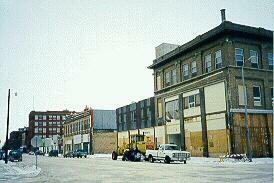 The west side of South Third Street, Dec., 1998. The city is putting new storefronts on these buildings. 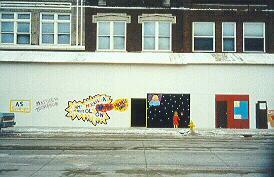 Grand Forks youth painted the temporary fronts to these buildings under the supervision of the Empire Arts Center, Dec., 1998.